The family of a Winnipeg woman with Alzheimer’s disease, who has facial injuries after falling while unsupervised, wants her out of the hospital she’s been living in for more than two years and into a place that can better meet her needs. 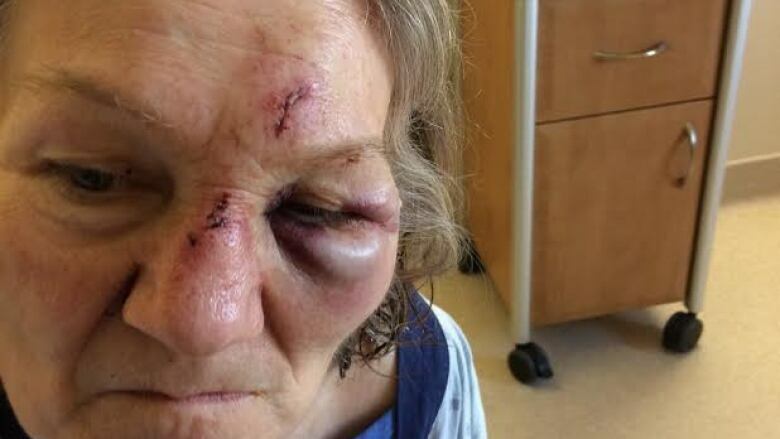 The family of a Winnipeg woman with Alzheimer's disease wants the woman out of hospital and into a personal care home after she fell and injured her face. Maxine Arnal, 62, has been in St. Boniface Hospital since February 2014 waiting for a personal care home bed. At the end of May, Arnal fell and injured her face. She was unsupervised at the time and her family says she is prone to falling. But nothing could have prepared her daughter for what she saw when she visited her mom. "I found her by herself in her room, her face was black and blue, there was blood on her face, blood on her gown," said Debbie Arnal. Arnal says hospital staff told her Maxine fell at least twice after being taken off of "constant care" — a form of supervision that requires a staff member to provide one-on-one care and supervision. 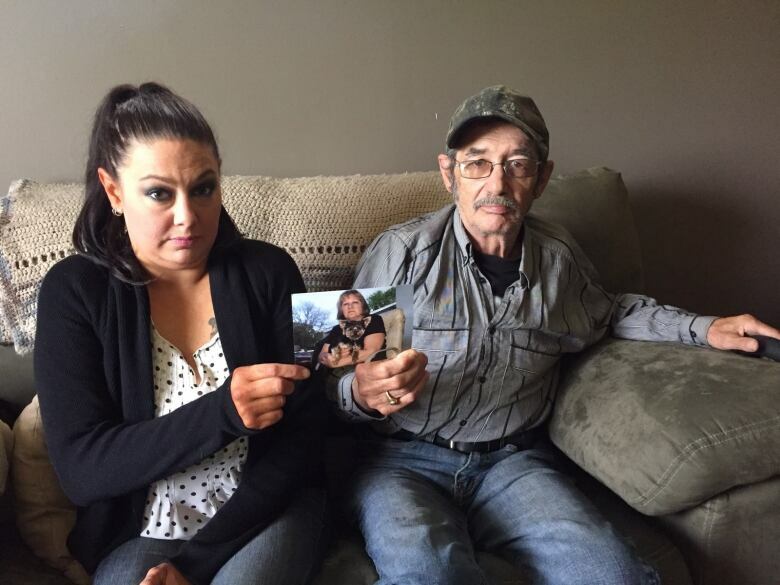 "You don't expect that, you come in the room and see your wife black and blue, as though she had a couple rounds with Mike Tyson," said Ron Arnal, who says he's paying $90 a day to keep her at the hospital. "Something's got to be done." The acting CEO for the hospital says he regrets that the falls happened, and the hospital made changes, including assessing all factors that can lead to falls and creating a care plan for Arnal. "There has been more supervision provided, there's been more staff added to the unit, so they can keep her under a closer watch," said Dr. Bruce Roe. Arnal's daughter says she's good with the added supervision, and there have been no reports of her falling since, but she's concerned it's only a temporary measure to a much bigger problem. "She's absolutely fallen through the cracks,' said Debbie Arnal. Maxine Arnal had lived at home with her husband, but early-onset Alzheimer's began to take her from him in 2010. As her needs grew and her memory faded, a home care worker began to care for her during the day. But she was prone to wandering and stumbling, and her husband feared daily for her safety. One night when Ron was asleep, Maxine wandered into a neighbour's house. "She got worse and worse and worse, and then she just lost it one night. She didn't know what day it was, where she was, I was scared for her. And my daughter phoned 911," said Ron Arnal. When she was admitted to St. Boniface Hospital in 2014, the family thought it would be only temporary. But 2 ½ years later, she's still waiting for a spot at a personal care home. "This is no life. This is not how end of life should be. A person that was so vibrant. Planted her garden, did all her herb gardens. And now it's resorted to she's in a locked room by herself. Fed, changed and bathed only once a week. You treat an inmate better than that," said Debbie Arnal. She says the last time her mother went outside was a year ago. Because of her safety requirements, she isn't able to leave the unit. Dr. Roe says the situation is frustrating for staff as well. "We understand the frustrations of the families, in their wait. We don't have the right environment, the right programming that can best meet the needs of these patients that have Alzheimer's and other conditions of the elderly," he said, adding that they need the care that's provided in long term care. A spokesperson for WRHA says while a typical wait for someone to be placed in a personal care home is between three and 18 months in Manitoba, some people wait longer based on their needs. Some forms of dementia, like Alzheimer's, require specialized care available in only a few homes, so the wait is longer. A spokesperson with WRHA's long-term care program added that a patient's status can change between their first assessment and when they finally find a placement. "If, for example, a patient is not medically stable, they would not be able to be admitted to a personal care home until the time that their health has stabilized," the spokesperson said in a statement. "It is absolutely a concern that the wait in this case has taken as long as it has and the long-term care program will continue to work closely with the care team at St. Boniface to best address the care needs of the patient." There are eight people in Manitoba who have been waiting in hospital for over a year to be placed in a personal care home. Dr. Roe says at St. Boniface Hospital, Arnal has waited the longest. "She has been waiting a long time and I would hope that we can find a place for her that would provide more appropriate care in a more appropriate setting," he said. She lives on a medicine unit, with 34 other patients whose needs also demand attention and time from the staff. "She doesn't want to be a burden on society. She doesn't want to sit in that hospital 24-7, being locked in a room. She's my mom," said Debbie Arnal. Maxine's husband says after 40 years married to his wife, he still "wants another 10." "She's doesn't have Alzheimer's like one of the regular Alzheimer's, she's got one of the worst cases," said Ron Arnal, adding the disease hit so early and hard. "So if she's got one of the worst cases, put a little more attention to her." Dr. Roe says he and hospital officials are meeting with the long term care co-ordinators and leaders soon to try to get Arnal into a personal care home.